 Home › Politics News › APC Lawmakers Warns Saraki Overs Electoral Bill, Promise Never To Allow Him Humiliate Buhari. APC Lawmakers Warns Saraki Overs Electoral Bill, Promise Never To Allow Him Humiliate Buhari. Promised Never To Allow Him Humiliate Buhari After His Refusal To Sign The Bill, Says Buhari Reasons To Refused The Bill Once Again Are Genuine. 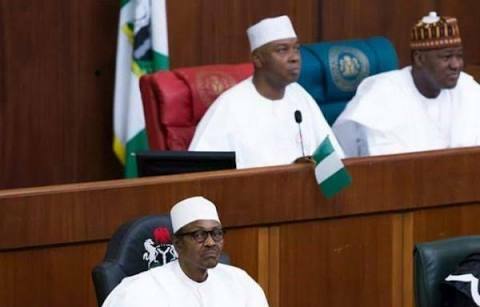 The battle will be between Senators of the All Progressives Congress, APC, and those of the opposition Peoples Democratic Party, PDP, as there are moves by the anti- Buhari Senators to override his veto. The matter which would come up during the Executive session tomorrow where the decision of the next line of action would be taken, following the rejection of the passed Electoral Bill, would have the Senators disagree sharply along party lines. President Buhari’s letter where he declined signing the Electoral (Amendment) Bill 2018 on the grounds that it was capable of derailing preparations for 2019 elections would be read to the Senators tomorrow because the letter got to the National Assembly on Friday when there was no sitting in both chambers. Senators on the platform of the APC who spoke separately with Vanguard have vowed that they would stop their colleagues in the PDP if there was such a move against the backdrop that the opposition party has no such required number to override the President’s veto. Also speaking with Vanguard, a very strong supporter of President Buhari, Senator Ovie Omo-Agege, APC, Delta Central who dismissed any such move, said that there was no way they will allow Senate President Bukola Saraki and the PDP Senators to carry out such an act at the Senate hallowed chamber. Senator Omo-Agege said, “As a caucus, we the senators of APC extraction will not allow saraki and his PDP crew to humiliate Mr President. We will not allow any override. They don’t have 73 votes in the senate to carry out their threat. On his part, Senator Gbenga Ashafa, APC, Lagos East has vowed that the Progressive Senators would block any move by the National Assembly to Veto President Muhamadu Buhari’s refusal to once again sign the recent amendments to the Electoral Act.